Tasteful Falafel made of chickpeas. Seasoned with garlic, cumin, parsley and coriander. From frozen: Fry on medium heat in a bit of ccoking fat, approx,5-7 minutes until the falafel reaches a golden color. 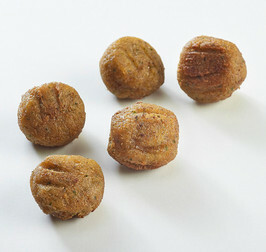 Chick peas (51%), water, onion, bread crumbs (WHEAT flour, salt, yeast), potato flour, salt, garlic powder, cumin, parsley, coriander, black pepper. Deep fried in rapeseed oil.